One of the biggest company transformations I’ve seen in all my years as an industry analyst is Vonage, which held its inaugural industry analyst event in Scottsdale, Ariz., last week. What started as a consumer VoIP company has evolved to a business communications application and platform provider, growing both organically and through acquisitions. Starting in 2013 with the acquisition of Vocalocity, which propelled the company into the UCaaS market, the company has acquired a range of companies, as well as technology and talent. Among the most recent and impactful acquisitions are CPaaS provider Nexmo, video API provider Tokbox, and CCaaS vendor NewVoiceMedia. As Masarek explained, intelligent interactions are “how employees engage with customers,” adding, “Don't underestimate the role of communications in digital transformation.” In a world of incredible rates of change, where 50% of the current S&P 500 will be replaced over the next 10 years, communications can help to separate winners from losers. What’s key is the marriage of employee experience and customer experience. With an increasing number of channels, people will use their channel of choice, which means that organizations need to effectively use communications tools to restore personalization and have intelligent interactions. Key to providing intelligent interactions is One Vonage, an integrated fully programmable communications platform. As a single microservices-based software platform, One Vonage brings together Vonage’s UCaaS, CCaaS, and CPaaS assets, while taking advantage of AWS and the latest public cloud technology. The company’s next-generation UCaaS solution, Vonage Business Cloud (VBC), is a proprietary platform that has been totally rearchitected and is based on the One Vonage microservices architecture. In addition, this new platform is architected so that everything is programmable and customers can mix and match programmable components with packaged components. I spoke with Masarek about One Vonage and how UCaaS (Vonage Business Cloud), CCaaS (based on the NewVoiceMedia acquisition), and CPaaS (based on the Nexmo platform and Tokbox acquisition) are all coming together. In this video, he discusses the key themes of the conference, the company’s transformation, and intelligent interactions. Masarek also describes the importance of the Nexmo CPaaS platform, and how Vonage sees programmable communications. During the conference we heard from Vonage about the importance of owning and controlling its own software and code in order to have an end-to-end solution. To differentiate from others and to have a path for the future, Masarek believes that it’s important for Vonage to build its own platform, rather than relying on partners. This is one of the key reasons Vonage acquired NewVoiceMedia. While Vonage was touting VBC, One Vonage, and the importance of owning its of platform and code base, the obvious question was, what about Vonage Business Enterprise, Vonage’s BroadSoft-based offering? Vonage made it clear that the BroadSoft platform is not going away, but the goal is to offer new customers the One Vonage platform. “We have a great relationship with BroadSoft, and the platform has served our customers well. We are continuing to significantly expand our customer footprint among large Enterprises, and will be providing them the One Vonage platform. For existing customers on the BroadSoft platform, we will migrate them to One Vonage when and if it makes sense for each individual customer. If it doesn't make sense, we will continue to support our customers on BroadSoft in perpetuity,” Masarek noted. Vonage made a lot of enhancements to its proprietary UCaaS platform, Vonage Business Cloud. Similar to many of the UCaaS vendors, Vonage is aiming to move upmarket, and has been enhancing VBC for the enterprise market. The company claims to have increased its 100+ seat bookings by 100%. Recent enhancements include an overhaul of the desktop and mobile user interface, providing an integrated user experience that combines voice, messaging, and video in a single application, as well as the addition of an integrated team messaging solution called VonageFlow. One of the more interesting enhancements is the new social messaging, VBC Messaging integrated with Facebook Messenger, which leverages Nexmo APIs to integrate with messaging applications. To get more clarity about One Vonage, VBC, and Nexmo, I spoke with Jay Patel, Senior VP, Product Management. Another key element of Vonage’s portfolio is contact center. The company has been partnering with NICE inContact, but recently acquired NewVoiceMedia (see my article discussing the acquisition). I spoke with Dennis Fois, President, NewVoiceMedia, about how NewVoiceMedia will be integrated into Vonage, how the company views omnichannel, and how customers can take advantage of an integrated UCaaS and CCaaS solution. He also discussed the Journey Insights Builder, which is essentially an IVR killer. Vonage covered a lot of information in the day and a half event, and if any analyst didn’t walk away with the understanding that Vonage is not just another UCaaS vendor, then they weren’t paying attention. This is all based on Vonage’s microservices-based One Vonage platform, bringing together the company’s UCaaS, CCaaS, and CPaaS capabilities, as well as the power of the Nexmo platform. 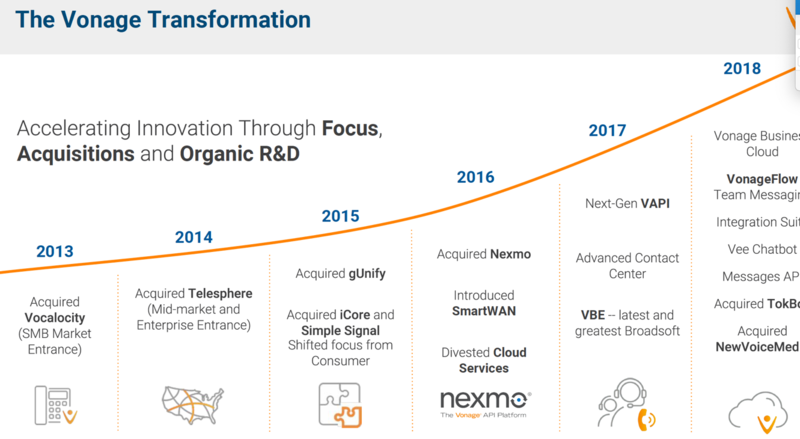 I believe that Vonage’s real differentiation is the Nexmo CPaaS platform, providing flexible APIs and programmable communications, while adding value to the UCaaS and CCaaS capabilities. 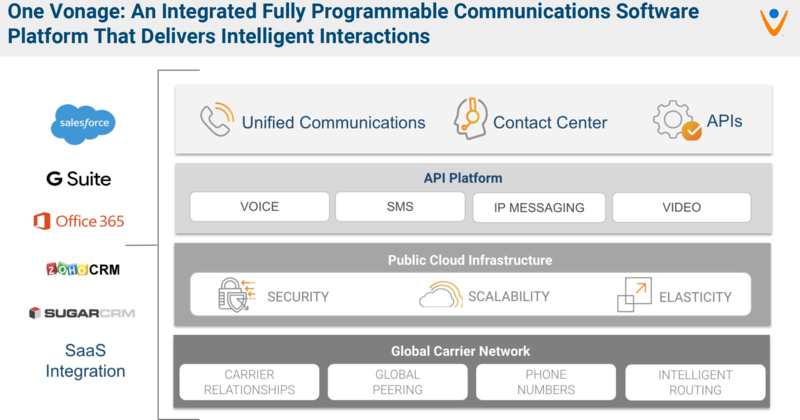 However, Vonage doesn’t have the monopoly on programmability, and I’d like to hear more use cases and examples of how customers can use programmable communications. The company is certainly working to set itself apart with its trifecta of solutions. As Masarek noted several times, the key will be in how well the company executes. One final note - I’d like to give a shout out to Jo Ann Tizzano, VP, Corporate Communications, for nailing her first analyst conference – kudos! And special thanks to CEO Alan Masarek for not only being available throughout the entire event, but for engaging with the analysts and being open about his vision for the company.